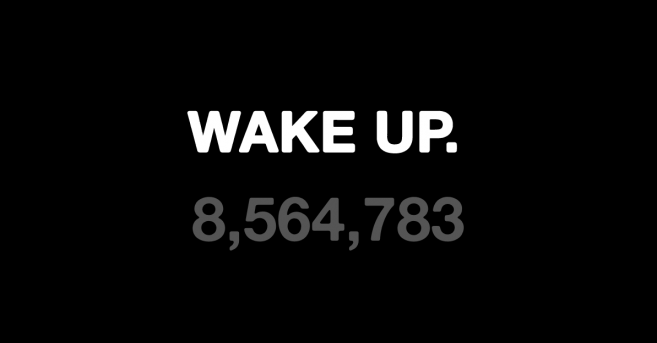 Samsung just officially denied any involvement with the “Wake Up” protest held outside of an Australian Apple Store earlier this week. Meanwhile, Samsung hosted a teaser website last week at tgeltaayehxnx.com (an anagram for “the new galaxy”) that contained a countdown similar to Tongue’s. The South Korea-based manufacturer redirected users to thenextgalaxy.com after the clock ran out last Monday. Samsung placed a video on the new page that assured users its next Galaxy device will “stand out from everyone else,” and then the video panned to a horde of sheep for the closing frame. The ad (below) is a dig at iPhone users, who are often scorned as “iSheep,” due to critics that claim they blindly follow Apple. Many assumed the video and flashmob’s timing were beyond chance, so rumors circulated that Samsung arranged the event through Tongue as part of its “iSheep” message. After all, such a campaign would —and did— garner international promotion for its upcoming Galaxy S III smartphone that is scheduled to unveil May 3 in London. Samsung employs protesters to ‘wake up’ Apple users?